Charging forward as fast as he can, ready to unleash his cannon of an arm, Brian van Meter screeches to a halt and waits. His target has acquired the same weapon and they watch each other like hawks waiting for the other to make a sudden move. Backup arrives for each man and the assault is launched. There are casualties on both sides and some move quickly off to the side of the battlefield – but only for a moment, until his buddy can thwart the enemy’s attack and allow for the sidelined man’s return to battle. 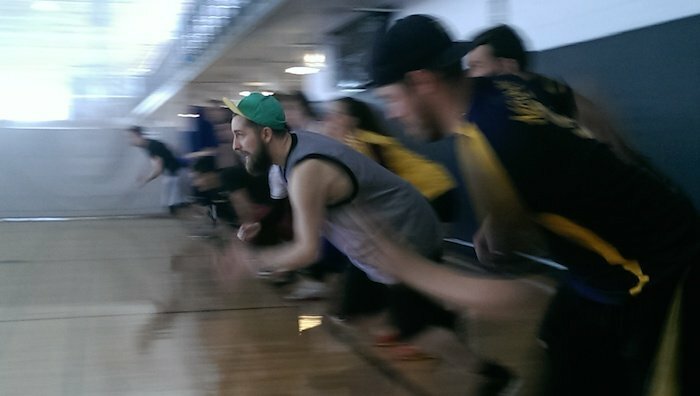 This was a common sight at the annual Dodgeball Hat Tournament at DePaul University, where more than 60 enthusiasts on six teams from across the Midwest engaged in one of the oldest and toughest of gym class sports Saturday. The sport rose to popularity within the last 10 years, which many attribute to the 2004 comedy "Dodgeball: A True Underdog Story." Today, tournaments like this are common to dodgeball players, many of whom participate in recreational dodgeball leagues whenever they can. Hundreds of teams belong to dozens of leagues and national organizations, including The National Amateur Dodgeball Association, the World Dodgeball Society and the National Collegiate Dodgeball Association. The University of California-Irvine broke the existing world record for the largest game of dodgeball with 6,084 participants in 2012. In Chicago, teams from across the region meet on a regular basis. Peterson and many of her fellow enthusiasts have been playing for some time now and say that the following is steadily growing. Another team member, Grant “The Riddler” Herrejon, is what they call a core member of the group. Despite the size of the crowd on the court, dodgeball is not necessarily a free-for-all. 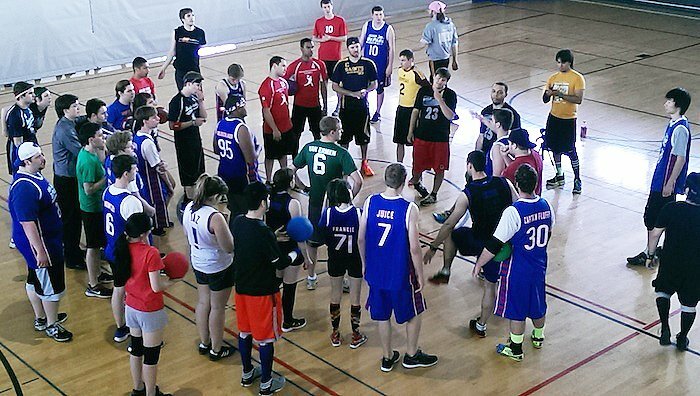 DePaul and surrounding universities follow the official rules of the National Collegiate Dodgeball Association. The NCDA is an official organization that outlines game regulations, hosts sanctioned tournaments each academic year and has partnered with the NCAA. Teams are made up of four to eight players and may start with anywhere from three to 10 dodgeballs. There are variations that have different goals in mind per game, such as Medic and Jail, but every format follows the same foundational set of rules. A player can go offsides or out of bounds in official dodgeball, resulting in a team penalty. There is a shot clock by which teams must release the ball, and red cards are handed out for any flagrant foul or unsportsmanlike behavior. Players constantly repeat the phrase, “headshots count.” This is not gym-class dodgeball, and the players are a testament to just how serious the sport is. Like other major sports, these players pay careful attention to their physical needs before, during and after a match. It’s not uncommon for people to arrive and begin stretching and taping body parts. And it doesn’t stop there. Kat Takeda, 23, of DePaul, has broken a tooth, fractured her radial bone in her arm and sustained other minor injuries during the opening rush of a match. Austin Dowls, next year’s team president, witnessed a player break his leg at a national tournament. Ice packs are a constant during matches. Still, players love the sport and are not discouraged when injuries arise. In their eyes, it’s just part of the sport. The true spirit remains its biggest factor in its growing popularity over the last several years -- sportsmanship. Each of these players looks out for each other and is quick to assist someone who gets injured out on the court. Contrary to popular belief, everybody gets a chance to play dodgeball. What was once perceived as a sport dominated by strong men now allows anyone to play. That means anyone of any skill level or physical ability is welcome to play. Abby Bokun is not a particularly large woman, in fact, she is often the smallest person out on the court. Grant Herrejon doesn’t possess a cannon like McCarthy or Tony “Freight Train” Bugajski. And Han Chitti cannot make it to every match. Still, they all contribute whenever possible and play a valuable role on the team. Herrejon is a strategist – he observes teams in-match and in his rest time and then finds ways to poke holes in the opposition. Bokun watches for any sudden movements and is quick to warn her teammates of an impending attack. Chitti is a beloved member of the group and increases morale with only his presence. This tight-knit community keeps the sport alive by finding a way to make everyone comfortable and valued on the court. Often, team members will hang out on DePaul’s campus after their twice-weekly meetings, which regularly push the Ray Meyer Fitness Center hours to the brink.